... Monday but I've promised a story that goes with this creation. This was made at our week away - showcased in the previous post but there is a story that goes with it and it's that story I've promised and it's definitely an 'ooops' story. This was Kim's shoebox card. The flowers are made with acetate (probably some form of packaging knowing Kim - lol!). 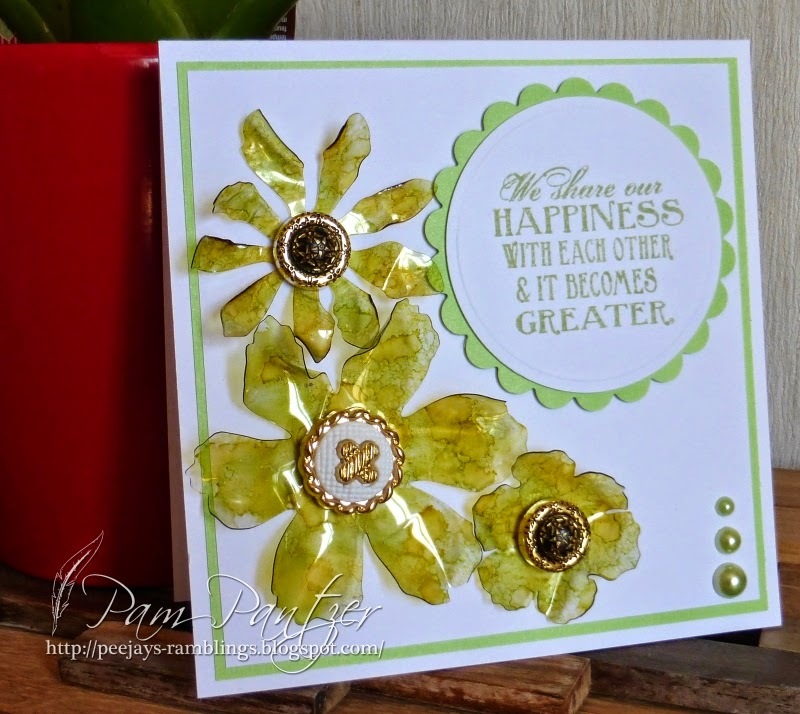 Tim Holtz Tattered Florals cut from acetate and then coloured with alcohol inks, in this case shades of greens and yellows. Once done a heat gun was used to soften the acetate to shape it and, once shaped and cold they were stuck to the card - I used silicone - and fancy buttons used for the flower centres. The story part of this comes with using the heat gun. Holding acetate flowers, heating and moulding really requires more than 2 hands so it was suggested ... by Kim .... that we hold the heat gun between our legs to give us 2 hands free to work the flowers. Excellent idea! Or, at least it was until it came to my turn. Me and Trace were the only ones in the Refectory crafting. I was sitting dealing with my flowers when I thought there was a strange smell. Trace comments on how acrid the smell was and she'd not noticed it before when others had done theirs and me thinking it really strange as well. Then I notice a plume of smoke and I suddenly realised that it was coming from the heat gun .... not surprising really as the nozzle was bright red and melting ! Definitely 'ooooops' big time! The mistake I'd made was not in putting it between my legs (everyone else before me had done the same) but in that I'd not made sure the air vents were free and I'd blocked them! Strangely, despite the damage, the heat gun still worked. It was, literally, just the plastic nozzle that decided it didn't like being overheated but the rest of it was fine but I certainly won't want to be covering those air vents any more - lol! Oh, and you don't really need both hands free to heat and mould the flowers. As long as they're warm they will happily mould and you can always reheat and remould if they cool too quickly.